Whistleblower Leads EFCC To Another N250m Recovery – Royal Times of Nigeria. The Economic and Financial Crimes Commission (EFCC) says it has intercepted N250 million in various currencies at the popular Balogun market in Lagos. The commission disclosed this in a statement issued late Monday. According to the statement, the discovery was made following a tip from a whistle blower. “The monies include €547,730 and £21,090 as well as N5,648,500 . The total haul is about N250m at the prevailing exchange rate at the parallel market,” the statement read. “The intercept followed information that about N250 million cash was being moved somewhere in the market for conversion into foreign currencies by unnamed persons. Operatives responded timely, met the money in bureau de change office, but a large chunk of it had been converted into euro and pounds sterling. “The BDC operators found in possession of the monies claimed they were acting on behalf of their boss who sent the money to them from one of the northern states in Nigeria. 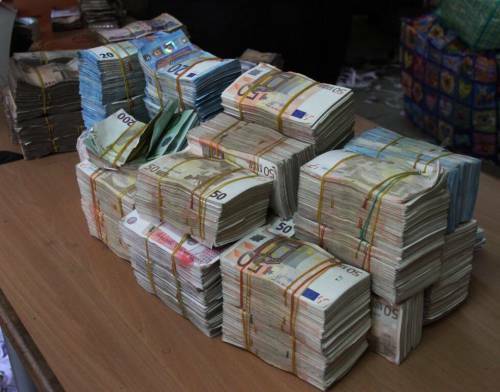 On Friday, the commission said it recovered N490 million from an abandoned shop in Victoria Island, Lagos.